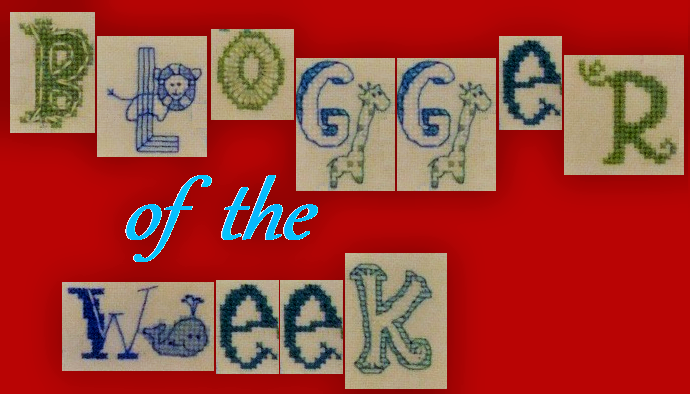 This week's Blogger of the Week is one of the nicest, funniest people with the strangest blog title that I know! Even harder to spell than Serendipitous! A keen participant in all my Blog Hops and our SALs where she wields the shoehorn like an expert martial artist in an obscure martial art using only everyday household objects to defend yourself. 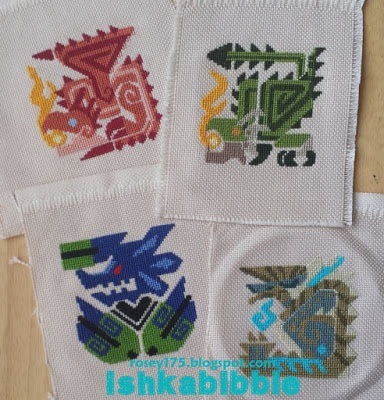 She stitches an eclectic variety of designs from gaming to nature with a fair mixture of feline fun in there too. You are going to enjoy this interview I am sure. But before I link to the blog, I do have the small matter of the Winner of the Recent Competition to announce. There were 12 entrants who all matched the stitchers with their pieces. Random Number Generator chose Kaye as the winner! Congratulations to Kaye, please let me know which store you would like your voucher to be from. Hi there, I'm Rosey, born, raised, and currently residing in Missouri, USA, and possibly from the planet Earth. I'm forever a country gal housewifey type but darned if I don't like high fidelity technological comforts and all sorts of nerdery. 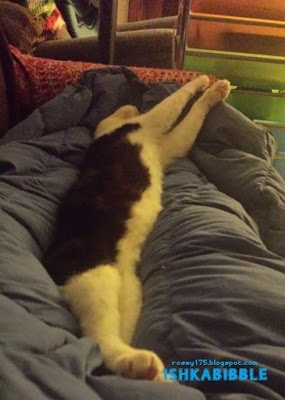 I have three silly cats (Klondike [B&W], Peanut [snowshoe-ish], and Oreo [B&W #2]) but only one silly husband who is the Best Souvenir Ever from my time in Hawaii. Unlike the cats, my husband is not named after food. And yes, we do sing "What would you do-OO-oo for a Klondike -cat-?" Well, my first time was back when I was but a Little Rosey, possibly 8-9 years old, in what I am sure was an attempt to make me sit still and shut up. It didn't go so well as I could neither sit still nor shut up for any reasonable amount of time. Later, when I became more sedate (cough), I picked it up again from a tiny kit found in a thrift store. This would've been in 2009 when the Real Stitching started and that little finish hangs as a magnet on my mother's fridge. My first blog was on Xanga, followed closely by LiveJournal -- not quite an early adopter, but still from the time when you had to have an invite code to join. This was very early 2002/2003. I still have that journal but it's mainly about life and all the complaints available to it. 4. How would you describe your stitching style? Are you a serial starter, a rotator, a OAAT (one at a time), highly organized, random and eclectic, etc.? 5. Do you have a favorite designer or style of design you are drawn to? SODA Stitch. I guess I might like cutesy stuff. 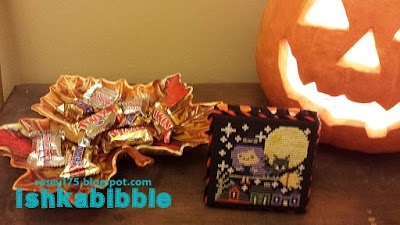 Frosted Pumpkin Stitchery. Definitely bright colors. Stoney Creek. I love having sets of things! A towel for every month, and possibly every holiday? Oh, yes, please. Nerdy stuff also attracts me like a moth to a flame. Daffodils, just surround me in daffodils. I've very found of Mucha artwork/style and have been slowly saving up to buy one of the delightful Disney Princess Mucha sets available on Etsy. 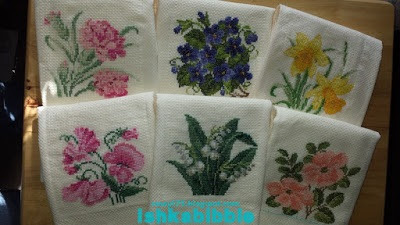 I greatly adore vintage/antique designs, whether it's needlework, sewing, or furniture! However, this weirdly doesn't apply to primitive designs. I wonder why? Probably any of the Final Fantasy pieces. I make the patterns myself and ignore most of them, stitching basically by whim and growing experience. A wall of FF pieces is my goal, abetted by my enthusiastic husband. Luckily, there are (as of this post) 15 "main" games so a wall is highly possible. I could even build the wall when they're all framed! I have FFVII and VIII completed, and III on the stand, haunting me. It's very close to completion. Very. You're gonna hear some high-pitched squeaking soon. The exclamation points, they are coming. That stupid fabric pen that wasn't a fabric pen. You source out your fabric for a piece (which is hard enough living in the middle of nowhere), mark the center with what is supposed to be a fabric pen but is really the permanent marker sitting next to it, and of course there is to be no stitching is in the center so well that whole piece of fabric is now TOTALLY USELESS. It's not even that bad! Just a tiny blue dot! I can use the fabric for something else! But I'm still mad about it. Oh, you know, only everything. I'll get around to tatting one of these days. And that sewing machine isn't going to fix itself (although it's old, it might). Bobbin lace looks fascinating. This is where the random and eclectic comes in. I will pick up a hobby on a whim. I think I'd really like to make a biscornu someday. And try hardanger. I've had my first experience with making a flatfold; that was fun! I like stained glass, too. Ooo, and maybe woodworking! The sky's the limit! 9. Do you have a box of finished-but-not-fully-finished pieces? Or is everything FFO'd? What's your favorite way to fully finish a project and what do you do with them? Yes, I have a few finished-but-not-fully-finished pieces, most of which are waiting for the Perfect Frame or the Money for the Perfect Framing. One of the weird things I have with crafting in general is that I can't just do it for fun, no matter how much I enjoy the process. The finished piece must have a purpose or a goal or place to go. So smaller stuff tends to get finished off quickly unless it's waiting for the rest of the the smaller things to be finished all in one go. My favorite way to finish something is to have it nicely framed, possibly with a fancypants mat. 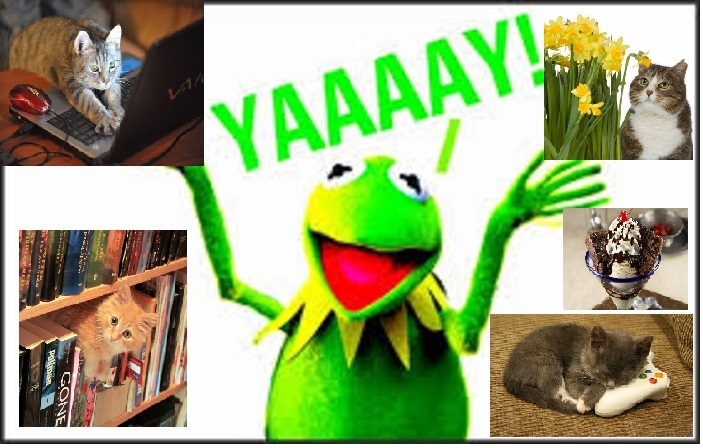 Is there a project out there with a person flailing about while being surrounded by cats, daffodils, computers, books, and video games? Oh, and brownie sundaes. That might represent me. I was probably a whirligig in an alternate life. And possibly this life. All these weird spellings, what. Sticking U's where they don't belong and omitting the neglected Z's. Scandalous. I fixed them. 'Merica. Haha, it's called The Queen's English! Got to love your little rebellious ways, with your independence, writing the date backwards and randomly dropping letters. America is SUCH a teenager at times LOL. But just to show there are no hard feelings I have worked hard and sourced the ideal chart for you. I've run it through Pic2Pat so I can email you a copy too! The Ishkabibble Flail with Added Cats. Hello Rosey,this was a very enjoyable read.I spy EMS flowers of the month.I must finish my carnation! How delightful to see you featured here, Rosey! (*waves to fellow former-LJer*) What fun to learn more about you and your delightful eclectic taste in crafting. Ooo another LJer; that almost seems like a rarity anymore! 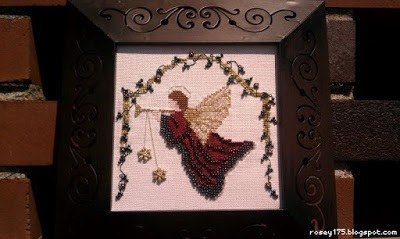 I still check out the cross-stitch community on there sometimes though it's no longer the bustling place it once was. 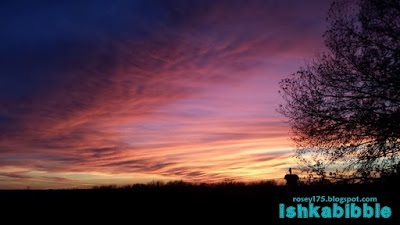 Rosey, love your whimsical post - lovely to learn more about you. Jo, So excited that I won! I will email you shortly. Thank you, thank you, thank you. 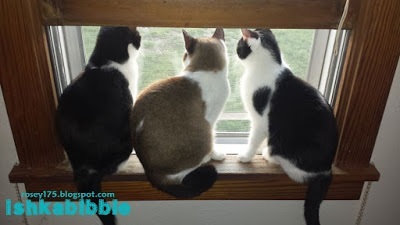 Thank ya muchly~ :D I'm glad my goofball cats can sit beside one another long enough to snap a picture haha. Lovely to read about your here Rosey. Very pleased to meet you Rosey! Nice getting to know you!AriadnefromGreece! So much fun to read your interview, Rosey. I had hoped to learn more about what Ishkabibble means, lol. But no, and you just leave me without a clue. Great stitched pieces you show here. 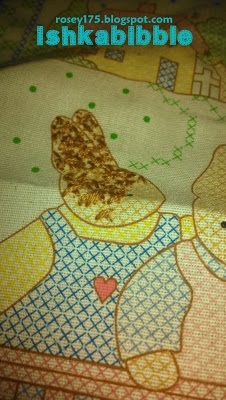 Not very funny to seize the wrong pen for marking the centre of the fabric. But hey, most of us have experienced a stitching disaster, so you are not alone. Hi Rosey! 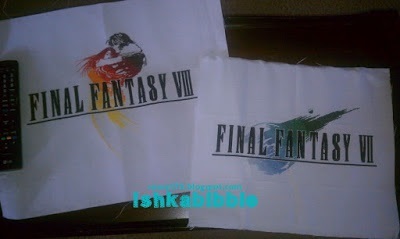 You know I already admired your Final Fantasy stitching, but it seems you have a lot more to show! We also seem to be quite similar in some respects - I can't craft without a specific purpose in mind (and sometimes I will really strain myself to find someone to whom I could gift that project I'd really love to stitch), I want to learn ALL the crafts and unfinished projects haunt me forever (which doesn't stop me from having way to many, though). Sooo...very please to meet you! Nice to meet you Rosey. Lovely to read about you Rosey. I enjoyed reading your most recent blog posts. What a fun post Rosey. It was not to learn more about you. That was so funny Rosey! I'm glad to finally know what Ishkabibble means...sort of. Where where where did you get the Beaker B? 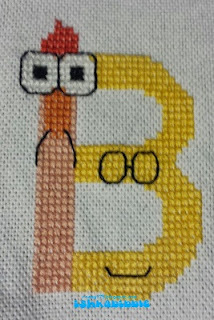 Is there a whole Muppet alphabet to go with it? I must know -- my oldest is obsessed with Muppets.